China's human rights record will be one of the key issues discussed during a meeting between the U.S. and Chinese presidents this week in Washington. Ahead of President Xi Jinping's state visit to Washington, U.S. National Security Adviser Susan Rice has called for the release of political dissidents jailed in China, while activists called for tougher U.S. measures against Beijing. Rice, who has made three official visits to China, told an audience in Washington Monday that she raised the human rights issue during every one of them. "Detaining lawyers and journalists and anti-corruption activists only reduces the credibility of China’s efforts to address its challenges, hampering its ability to achieve a prosperous and stable society," she said. "Blocking free access to the Internet at a time when the rest of the world is moving towards greater openness and connection only cuts off opportunities for the Chinese people to advance." Chinese President Xi Jinping stands during a meeting with U.S. National Security Advisor Susan Rice at the Great Hall of the People in Beijing Aug. 28, 2015. U.S. rights groups and politicians say China's state-sponsored human rights abuses have worsened under President Xi. "China is in a race to the bottom with North Korea for the title of the world's worst violators of human rights," said Rep. Christopher Smith, a Republican from New Jersey. Advocates invited to testify at a recent U.S. congressional hearing criticized Western nations for dealing with China. "I think largely China's human rights is so bad, I think is largely because of the appeasement policy from the Western countries like the United States," said Yang Jianli of Initiatives for China. Many are calling for U.S. legislation linking China's human rights record with its ability to do business with the United States. Activists also have raised the question of legitimacy of the current Chinese government, which they say no longer represents the will of the majority of people. "The rulers, particularly dictators, will use the nationalism to indicate the extreme to defend it, and even create crises and external issues, and conflict in order to consolidate the internal support and repression," said Xiao Qiang of the China Digital Times. 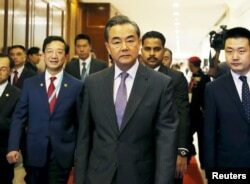 FILE - China's Foreign Minister Wang Yi arrives at a meeting. Speaking ahead of Xi's visit to the United States, China's Foreign Minister, Wang Yi, highlighted China’s unique history. "China will deliver a clear message to the government and the public of the United States and the whole world that as a major country in the East with a long history of over 5,000 years, China will stick to its own path of building a socialist country with its own characteristics," said Yi. 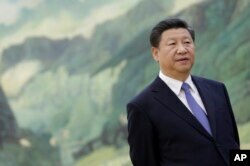 China has routinely rejected any criticism of its human rights record, calling it interference in its internal affairs.